Natural resource exports provide opportunities to drive growth and human development or they can result in slow growth, poverty and conflict. Resource-based countries face a higher risk of experiencing violent conflict because of increases in unemployment, inequalities and inadequate provision of social services, particularly education. The resource sector can become the ‘default sector; mainly as a result of its relative immobility or capital intensity, resulting in a negative cycle of resource dependence. 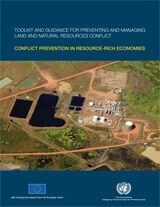 Resource-dependent countries that have avoided violent conflicts have by and large adopted economic policy measures that were conflict sensitive in their design and implementation. Such policies included 1) the promotion of economic diversification; 2) the allocation of revenue that ensures progressive distribution of wealth to address vertical and horizontal inequalities; 3) the adoption of macroeconomic policies that promote public investment that stimulate employment and that make non-resource exports competitive through exchange rate management.